The inshore waters of Miami have some of the best Tarpon fishing found in the world. The average Tarpon found in the Miami area runs from 60 to 120 lbs., with plenty of 150 lb.+ class Tarpon being caught every year. Tarpon are known best for their spectacular high flying jumps. Can’t get off of work to go fishing? These trips are tailored to you! Most trips start after you get off of work. Tarpon fishing at night and early morning can be awesome. It’s true that tarpon are nocturnal and do most of their feeding between dusk and dawn. If you have not tried this you are really missing out. Good spots that are inundated with anglers during the day can be barren at night. Less boat traffic equals more fish willing to take a bait. Haulover inlet and the surrounding area is one of my favorite areas for Tarpon. Give it a try you’ll love it! The prime tarpon season is March – June. Biscayne Bay is the largest estuary on the coast of southeast Florida and is contiguous with the southern Florida Everglades and Florida Bay. It encompasses a marine ecosystem that totals approximately 428 square miles. Its drainage area is 938 square miles, of which 350 are freshwater and coastal wetlands in Miami-Dade, Broward, and Monroe counties. It is home to Biscayne National Park, the largest marine park in the U.S. national park system, and to Oleta River State Park, Bill Baggs Cape Florida State Park, the Biscayne Bay Aquatic Preserve, Barnacle State Historic Site, and numerous local parks. Biscayne Bay is part of a large south Florida ecosystem and relies on water that flows directly from the Everglades, through the watershed and into the bay. Biscayne Bay is many things to many people. It supports important sport and commercial fisheries. It is a source of environmental education and recreation. Its waters and shores are favored for sailing, boating, snorkeling, swimming, bay viewing and sunbathing. More importantly, the bay is ecologically significant, supporting and nurturing an enormous variety of wildlife. Biscayne Bay (Key Biscayne)is actually attached at the north end to the mainland, and is therefore not considered part of the Keys by some Floridians. It is, however, part of the same geological formation, atop which sits coral rock islands, as well as partly-submerged mangrove islands. Just like previously mentioned in the upper keys some of the biggest Bonefish and permits roam this area! Flamingo is located in Everglades National Park. And holds a beauty incomparable to any other place in the world! Everglades National Park is the largest subtropical wilderness in the United States, boasts rare and endangered species. It is home to nearly 300 varieties of birds, 600 kinds of fish and more than 40 indigenous species of plants, the Everglades is a nature lover’s paradise. This national park is the 3rd largest in the lower 48 states, covering 2500 square miles! It has been designated a World Heritage Site, International Biosphere Reserve, and Wetland of International Importance, significant to all people of the world. One third of Everglades National Park is covered by water. Creating excellent fishing opportunities with just about every fish we target available. If you are looking for a true escape from daily life, and a great time fishing, a backcountry fishing trip is right for you. Not only will a backcountry trip give you the chance to reel in a great catch, but it is also a wonderful opportunity to see the diverse wildlife of the Florida backcountry. You will be amazed at the views and wide variety of birds you can spot on your backcountry fishing adventure. A backcountry adventure is a true getaway as you leave inhabited areas for untouched mangrove shorelines. While the term backcountry fishing often encompasses any fishing with a backcountry guide, including flats fishing, flamingo is a true backcountry fishing experience visiting often inaccessible and untouched lands. I cannot say enough about this place! The islands of the Florida keys lie in the Florida Straits, dividing the Atlantic Ocean to the east from the Gulf of Mexico to the west, and creating Florida Bay. Florida Bay is an inner-shelf lagoon: a shallow body of water situated along the southern-most tip of the Florida Peninsula. The Florida Bay consists of a combination of waters – salt water steaming from the Gulf of Mexico is mixed with the everglades freshwater, creating an estuary that flows between and around several hundred mangrove-islands. Nestled between the Florida Keys and Florida’s mainland, the Florida Bay has a plethora of interconnected basins and each basin, on average, is three feet deep. At its greatest depth, the Florida Bay is nine feet deep. The majority of the Florida Bay is located within the confines of the Everglades National Park. The shallow waters of the Florida Bay make for some incredible fishing opportunities. Inshore boats are the first in a series of shallow-draft inshore fishing boats that make perfect bass boats for partners to search for their next trophy in the shallows. Featuring a broad, stable, Single Piece hull, most are between 16′ and 24′ and float shallow for lake and stream fishing, and is large and strong enough for runs inshore. Most have live wells, massive storage compartments, locking rod boxes, and loads of standard features make this base model of boats ready to go and compete with the any fleet. 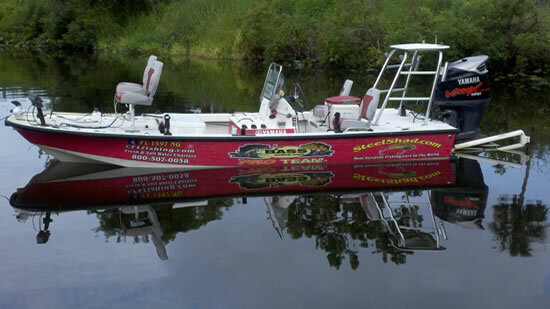 Our inshore fishing boats also are tricked out with options including trolling motor, t-tops, and seating. Check out your photo gallery above, a limited number of images above as boast change every year or so. Captain Brian has over 40 years of fishing the Miami area, including the Eveglades, the Keys, and Biscayne Bay, Captain Brian has caught just about anything that has gills, fins and can swim. Captain Brian was raised in Miami Florida. Brian catches fish almost daily and enjoys family fishing outings, he is the Bass Pro Pro Staff representative for South Florida working out of the Dania Florida store. Fishing the waters from Palm Beach, Miami, and Ft Lauderdale for the past 20 years! Captain Brian has mastered Miami area over the last 12 years and realized his love for Biscayne Bay – its beauty and its incredible fishing opportunities. As a Miami Inshore Fishing Guide he shares his experience and fishing knowledge of Biscayne Bay with new friends; whether a beginner, intermediate or a professional. 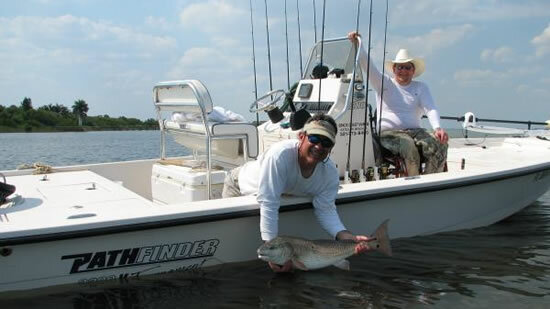 Brian likes light tackle in search of Sea Trout, Permit, Bonefish, Tarpon, Snook, Barracuda, Snapper, Grouper and Sharks. His knowledge on your trip will provide safety and major entertainment. Captain Raul is a Miami native that has been fishing since he was born! He grew up fishing for pelagic fish from sailfish, kingfish, and dolphin from Miami offshore to the lower keys offshore Atlantic and Gulf waters. By the time Captain Raul was a teenager, he started targeting inshore species such as the world famous bonefish, permit, and tarpon. You can say the rest is history. He fell in love with the idea of catching big fish on light tackle, especially with a fly rod. Captain Tom was born and raised in Stuart, Florida. Tom caught his first fish at the age of two on a family fishing outing, he was hooked and has been light tackle and fly fishing the inland waters from Stuart, Miami, and Islamorada for the past 40 years! Tom moved to Miami 12 years ago and realized his love for Biscayne Bay – its beauty and its incredible fishing opportunities. He decided to become a Miami Florida Fishing Guide to share his experience and fishing knowledge of Biscayne Bay with new friends; whether a beginner, intermediate or a professional. Tom specializes in fly and light tackle in search of Permit, Bonefish, Tarpon, Snook, Barracuda, Snapper, Grouper and Sharks. Tom’s goal is to share as much fishing and local knowledge as possible on our trip while providing safety and major entertainment. Previously, Tom owned a staffing agency, and understands the meaning of Customer Service! Capt. Jim is a South Florida Native who credits his grandfather and his father for his fishing expertise, both fishermen taught him his beginning and thereafter he has learned it on his own with many years of experience. He has been guiding for 15 years. When Jim has a day off you will find him fun fishing or looking for new places and techniques to try, or tying his own flies which he enjoys wholeheartedly. He enjoys taking children on rod bending days where some will find the passion for fishing that he grew up on. He is also a big conservationist being a part of CCA. The Florida Guides Association and an I.G.F.A. certified captain and participating in Bonefish and Tarpon studies with the University of Miami. Capt. Joe is a flats fly fishing and light tackle fishing guide in the areas of Biscayne Bay, the upper Florida Keys and Florida Bay and is a licensed fishing guide for Everglades National Park. Captain Joe has been fishing the waters of South Florida since the age of 4. Joe specializes in hunting the flats of Biscayne Bay, the upper Florida Keys for Tailing Bonefish, Tarpon, Permit, as well as Snook, Redfish and Seatrout. Capt. Joe started his fishing career at an early age catching freshwater Bluegills and Bass in the lake behind his Grandmother’s house and then catching his first Snook at age 8. By that time his parents knew he was hooked and bought him his first serious outfit, and old Pflueger Spinning rod combo. Once Joe and a friend acquired a flats boat, everything else was history. Capt Joe just added SEADEK to his flats boat for extra client comfort. 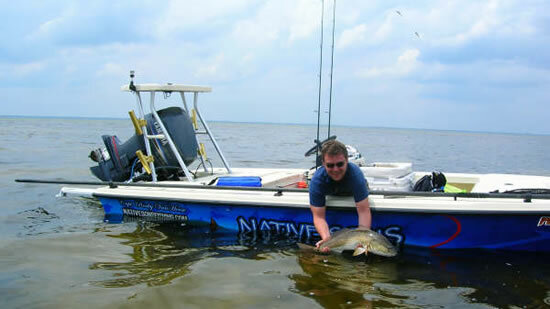 Redfish are one of the most popular backcountry and flats game fish. Redfish will take a wide variety of flies, lures, and top water plugs. This makes Redfish one of the most sought after fish by light tackle anglers. They are one of the hardest fighting fish on the grass flats. Snook are seasonal in Florida waters. They can be found in inlets, backcountry mangroves and flats. Snook on light tackle and fly rod are a favorite method for serious anglers. Snook like live bait best like shrimp, crabs and fingerlings but will take artificials and flies. Pound for pound -Permit are among the hardest fighting fish in Florida’s salt waters! They can grow over thirty pounds and are a sought out by light tackle specialist. Permit eat small crustaceans like shrimp, crab and sand fleas. The Permit, is a relative of the Jacks and relatively a common catch from Wreck fishing in South Florida. They can also be sight fished on Florida’s Flats. Bonefish are one of the most popular sport fish on the flats. More has been written about bone fishing that almost any another light tackle species. 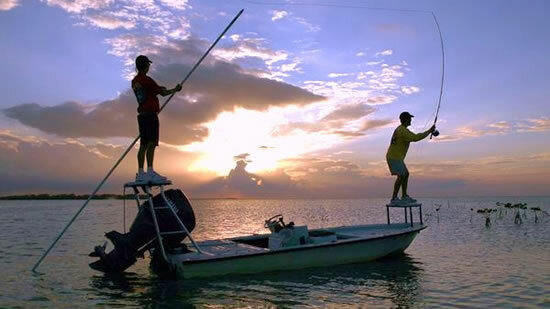 Sight fishing for bonefish is the most popular method using light tackle and fly. The Keys are home to the largest bonefish species in the world! Bonefish are found on sand and grass flats on both the Ocean (Florida Straits) and Gulf (Florida Bay) sides of the Keys in water as shallow as a few inches. Bonefish feed on small crustaceans like crabs and shrimp. For a thrill of a lifetime go bone fishing!! You are welcome to bring alcohol on board any of our charters, but please avoid bringing glass on board as it poses a safety hazard. Live bait is typically not included in the price and the cost is the responsibility of the charter although the guides does catch a lot of hi bait for free. Most all bass boats do NOT have a bathroom (“head”) on board (but are generally close to restrooms while fishing) At anytime with a short notice we can take to you to a marina or restroom facility. We can arrange custom catering on most all trips, ranging from drinks and snacks. Most of the locations also have access to resorts on the water for lunch. Children are very much welcome and permitted on all charters and there is no minimum age. Any fish that are caught on your charters and are legal to take belong to you, Florida State law regulates what you can and cannot keep and your captain will know these. All of our charters provide a cooler with ice for you to store any food or beverage you bring. We also provide bottled water. A 15-20% gratuity for your Captain is customary and not included in the price. Everyone on saltwater charters ONLY are cover by state law when purchasing a chartered saltwater trip! We will provide the exact address of the boat with your confirmation or upon request, locations are subject to change depending on weather. Due to US Coast Guard regulations allow charter boats a limited to a maximum of four passengers. Many of our boats will only accommodate two or three, this is why its important to let us know at the time of booking so we can get you the biggest boat available. Unless otherwise stated or discussed, you are chartering the whole boat and there is no additional parties. Seasickness is another term for motion sickness and typically manifests itself in the form of fatigue, nausea, and vomiting. In the inshore charters there is no need to be worry about seasickness as the water is calm.